User Rating is an overall score of your subscribers activity. We calculate each subscriber score based on their activity during the last 60 days. We take into consideration open rate, click-through rate and the general number of sent campaigns. For instance, if your recipient unsubscribes from your newsletter he gets "zero" star. But if a subscriber regularly reads your campaigns, clicks the links he will get "five" stars. User rating is displayed next to their emails. 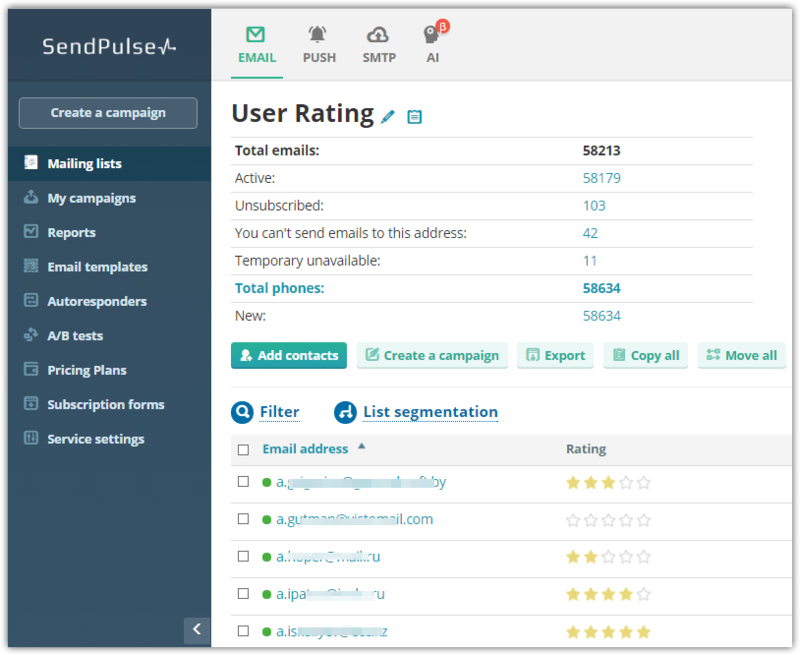 Go to "Mailing lists" section and open any mailing list to view user rating. Why do we need User Rating? This feature will allow you to better understand your user activity as well as target each group based on their score. For example, you can send special discount offers to only a specific group of users to try to increase their participation or create a loyalty program for your most engaged users. Rate this article about "User Rating"